Successive organization of Japan Society of Grinding Engineers merged with Kansai Society of Grinding Engineers both predecessors were established in 1956. 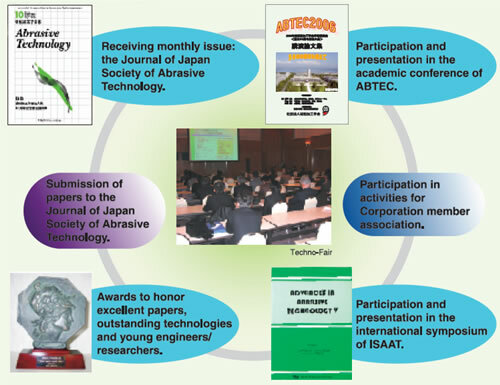 Attracting worldwide attentions by the name of JSAT(Japan Society of Abrasive Technology). A wide range of technology covering advanced materials,semiconductor,precision machine tools and instruments, automobile, aviation and space, energy and nuclear power, environment and medical treatment,electronics,communications and optics. Offering technological information and knowledge directly associated with production site. Holding ISAAT(International Symposium in Advances in Abrasive Technology) event year. Playing a core roll for development of abrasive technology in the countries of Pacific rim. Holding academic conference of ABTEC(Abrasive Technology Conference) once a year across Japan. Offering a variety of programs including research committees, expert committees, tutorial courses,regular meeting,technical tours and visits,open seminars and Techno-Fairs for corporation members.